Cristina and George were so much fun to photograph! They had a really fun group of people in their wedding party. The wedding ceremony was at St. Joseph Church in Niagara Falls (now Holy Family of Jesus, Mary, and Joseph). We went for photos at Haseley Farms in Lockport, then to Wagner Farms in Sanborn NY. The reception was at Samuel's Grande Manor in Williamsville. The bride got ready at her parents house. They had the cutest little room off of the kitchen we used for her to get dressed in. There was great lighting and very simple walls and furniture for portraits. We really liked this white antique mirror on the wall and knew right away we wanted to use it with the bride. We moved a few things in the room to make it possible for Cristina to be framed in the mirror like this. Once it was perfect, we brought her veil to the side and over her shoulder. Then we had her look down. This image she has no smile, as we were going for a more dramatic look. But we got some great images of her smiling and laughing after this and looking toward the mirror. 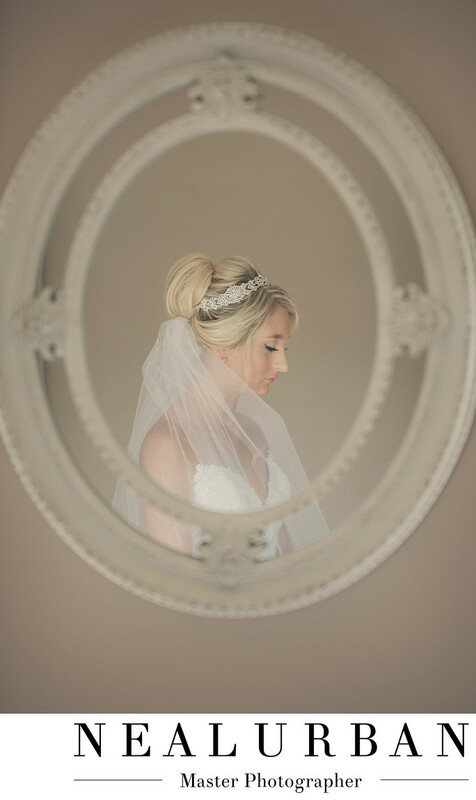 We love working with reflections and doing simple posing for the bride getting ready. Cristina liked the bright and airy look for her wedding. She picked some really great locations for us to work with too! Location: 8750 Main St. Williamsville NY 14221.